Are you interested in annual global population trends? 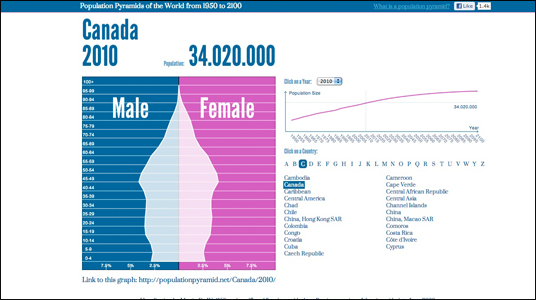 Population Pyramid has a created an easy to read, visual, interactive pyramid graph. It’s a great way to comprehensively understand population trends in different countries and regions around the world. This entry was posted on Saturday, October 20th, 2012 at 9:18 pmand is filed under . You can follow any responses to this entry through the RSS 2.0 feed. You can leave a response, or trackback from your own site.